The 2016 U.S. Olympic Women’s Basketball Team (8-0) rolled to a sixth straight Olympic gold medal and remained undefeated at the 2016 Olympic Games with an impressive 101-72 win over Spain (6-2) on Saturday afternoon at Carioca Arena 1 in Rio de Janeiro. The U.S. women now have won eight gold medals in Olympic competition, own a 49-game Olympic win streak and an overall record of 66-3 since beginning play in 1976. Serbia (4-4) beat France (4-4) 70-63 to win the bronze medal. The game was close for the first 13 minutes before the USA began to pull away. Led by four players in double digit scoring, including Diana Taurasi with 17 points on 5-of-7 shooting from 3-point and Lindsay Whalenwith 17 points and six assists, the USA got 55 points off its bench, outrebounded Spain 51-28 and scored 23 points off of 17 Spanish turnovers. The first quarter saw six tied scores and four lead changes before the USA closed with seven straight points to take a 21-17 lead into the second quarter. The first 10 minutes saw eight different U.S. players score and 14 points from non-starters. The run stretched into the second quarter when Sue Bird made a 3 at 9:36 to bring the score to 24-17. Spain responded and cut into the margin with its own 3-pointer at 6:54 to bring the score to 27-24. The USA held Spain scoreless for the next 3:37, however, while it tallied 10 points, including back-to-back 3s from Taurasi, to lead 37-24. Spain ended its drought at 3:17, but the USA again closed strong, outscoring Spain 12-6 to go ahead 49-32 at halftime. 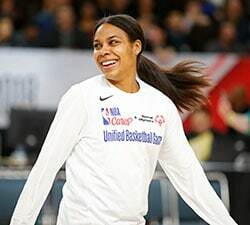 Maya Moore scored nine of her 14 points in the second, while the U.S. defense buckled down in the second period to hold Spain to 5-of-18 shooting (.278) from the field. Moore also finished with six assists. The USA was a red-hot 77.8 percent from the field (14-18 FGs) while it raced to 32 points in the third quarter, and it held Spain to 33.3 percent from the field (6-18 FGs) and just 17 points in the period to all but seal the win. Nine U.S. players put points on the board in the third, including two more 3s from Taurasi and six points from Elena Delle Donne, who tallied 10 in the game. Spain, which was playing in its fourth Olympic Games and its first medal game, outscored the USA 23-20 in the fourth quarter as the USA cruised to the 101-72 win. 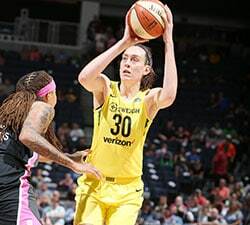 Breanna Stewart, who finished with 11 points, pushed the USA into triple digits with the USA’s last field goal with 35 seconds remaining to make it 101-70. 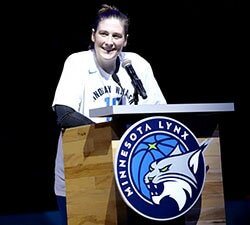 The USA’s assistant coaches were Doug Bruno, Cheryl Reeve and Dawn Staley. In the U.S. women’s Olympic single-competition record book, Taurasi made a record 33 3-pointers, while as a team, the USA set records for field goals made (324), field goal percentage (.577), 3-pointers made (58), 3-pointers attempted (128), free throw percentage (.776) and assists (224). In the U.S. women’s Olympic career record book: Taurasi now lists second for points scored (379), behind Lisa Leslie (488 points); Catchings lists third for rebounds (137), behind Leslie (241) and Katrina McClain (166). Sue Bird, Tamika Catchings and Diana Taurasi join Teresa Edwards and Lisa Leslie as the only athletes in history with four Olympic gold medals in basketball. Seimone Augustus and Sylvia Fowles collected their third Olympic gold medals to join three-time Olympic gold medalists Katie Smith, Dawn Staley and Sheryl Swoopes. Sue Bird, now with eight medals in major international competition ties with Edwards for the most medals in major international play. With one more gold than Edwards, however, she owns the most gold medals in U.S. history between the two events. Catchings and Taurasi, move into a tie for second with Leslie, earning a total of seven medals each at international basketball’s top two events. Brittney Griner becomes the 10 athlete to win Olympic gold, a FIBA World Championship title (2014), a WNBA crown (Phoenix Mercury, 2014) and an NCAA Championship (Baylor, 2012).